JOW 928 is a Guy Arab UF, dating from 1955. It has a Park Royal body and, in the first view it has been renumbered to 903 for duty with the Council’s Welfare Department. It is in the Southsea rally on 17 June 1984. This second view shows it restored to its original fleet number, 255, in the yard at Portswood for an open day. 9 July 1988. Southampton had twelve of these Guy Arab UF buses, the chassis of which were purchased in 1952. The first six, 244 – 249, were bodied immediately, but the others did not receive bodywork until 1955. The date of 1955 shown in the heading is thus only half correct. It should be 1952/55. Originally, the first five bodies were of B26D dual doorway layout, but this was quickly changed to B36D, which is the form in which the later ones, 250 – 255, first appeared. Nos 244 – 249 were withdrawn in 1963, and the remaining five had their bodies altered to B39F form in 1964, though, strangely, 254 and 255 were withdrawn from service in that same year. 252 went in 1968, but 250/1/3 lasted until 1971. More pictures of these buses may be found on the OBP Southampton gallery. An underfloor of real character: uncompromisingly no-nonsense bodywork, a good solid chassis and wonderful sound-effects. My only ride on one of these was not in Southampton but with an independent in Lincolnshire. 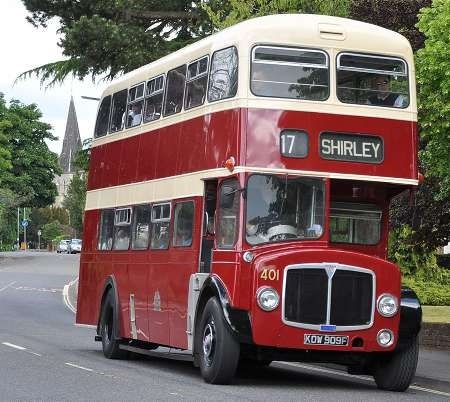 Is JOW 928 the bus that is now under restoration by the Southampton group? Another question: did any heavy UFs have the five-speed gearbox that was fitted to the LUF? As I understand the position, Ian, the UF and later LUF models all had the same catalogued transmission options, i.e. four or five speed constant mesh or four speed preselector. Whether any UFs actually had the five speeder is another matter of which I am uncertain, but a few did have the preselective box. Do we know what the L in LUF stood for? Light, Chris? At least, that would be my guess. KOW 909F was in the last batch of AEC Regents delivered to Southampton, in 1967. It is of the 3D2RA variety and the body was built by Neepsend, to the H70R formation. It was decorated in the early 1980s as being the Transport Department’s last rear entry bus, but then came Deregulation and it was returned to service. In this view, it is in Highfield Lane, on a special running day to mark the closure of Portswood Depot. It’s 30 May 2010. When all the perfect ingredients come together you get the perfect end result as in this case, having the best chassis of it’s type with elegant well balanced bodywork finished with a simple and tasteful livery, to me proves the point. All that is missing, understandably are the sound effects of the AV691 engine and the Monocontrol gearbox the thought of which brings me over all nostalgic. Glad you liked it, Dave! Those indicators worked on my Dinky VAL! The reason I asked was that, Southampton being quite conservative (small c) in it’s view to change (Late model Arab III’s, etc), it seemed an odd thing to do when the rest of the fleet (Arab III’s, Arab UF, PD2, PD2A, Regent V) were fitted with a different type of side indicator, mounted at waist height, just behind the cab door. These lights were quite ornate in shape, and had been used since the first buses were fitted with flashers (on the front only as I recall). I think they might have been made by Rubbolite, they were the same as fitted to Dodge 500 series trucks. I can imagine the Stores having boxes of these in stock, looking up at the new buses & saying "there goes the budget"!! I think the next change must have been to the teardrop shape Lucas flashers on the Atlanteans. Comparing this with a photo of an earlier example, I notice that an emergency window has appeared immediately aft of the cab. It could be that the relocation of the flasher from that position had something to do with that. Alternatively it might just have been a a belief that the flashers would be more noticeable on the front of the bus than at the side, possibly following some sort of incident. And of course nobody would have known that they were going to be useless on a sunny day when they ordered them from the catalogue! The indicators were one of two versions offered by East Lancs/Neepsend at the time. The other type was fitted at the same height but on short arms protruding from the body with round orange plastic covers so the indicator could be seen from both front and rear. 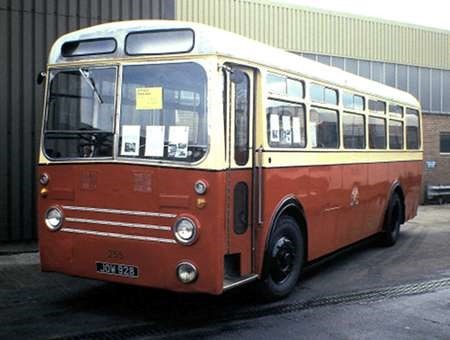 An exception were Reading’s East Lancs bodied Lolines which had the traditional side indicators fitted on the very front of the between decks panels. The comments about the type and positioning of the front indicators reminds me that Eastbourne Corporation’s two batches of PD2’s had different types, the 1966 batch No’s 71-80 BJK 671-680D had two a teardrop shaped fitted at lower deck window level behind the cab door and a round flat lense mounted on a shaped housing low on the front wing, the latter looking something of an afterthought. The second batch No’s 81-85 DHC 781-785E had the same type of high mounted type as the Southampton Regents I don’t recall any problems with them. I remember the Ramsbottom East Lancs PD3s had that arrangement of flashing indicators. LOW 217 is a Guy Arab III with Park Royal H56R body, new in 1954. It is still owned by Southampton City Council and we see it turning from Portswood Road – this section being known locally as Portswood Broadway – into (Old) St Denys Road. It is 30 May 2010 and there is a running day to mark the official (but not actual) closure of Portswood Depot. The actual closure was delayed by about three months because the new depot at Empress Road wasn’t ready. These buses looked rather old fashioned for 1954. By then rubber window mounts and ‘new-look’ fronts were well established. Perhaps Southampton valued standardisation more than up to the minute styling as these were the last of a very large batch of early post-war Guys. Yes, Philip, I think you’re right. The next batch to arrive was the PD2 with Midland Red front, then the PD2A and Regent V before the Atlantean. Bill Lewis managed to modernise the livery on the Atlanteans to something like the Manchester style, and I’m not sure why he didn’t deal with the older vehicles as well. Perhaps Nigel Frampton can advise! Bill had other difficulties with his Committee – they were adamant that they would not follow the trend to overall adverts – the best he could achieve for many years was the ‘wrap around’ style and, although other Councils, including our neighbours Bournemouth and Portsmouth had coaches or dual purpose vehicles for private hire work, Bill was not allowed to have them. I have a strong suspicion that the presence of a local coach proprietor on the Committee had more than some influence there! What about a declaration of conflicting interests? Arab III/Park Royal might look a bit old fashioned, but elegant at the same time, especially in the standard livery. I think you might agree that neither the PD2 or PD2A could be described as pretty, particularly in the "red look" livery. Wasn’t the livery on the Regent V/East Lancs/Neepsend pretty much the same as the Guys, except for no silver roof? As far as private hire was concerned, I think you are most likely correct & add in a number of rate paying coach operators in the district & there’s no contest! Had this Guy Arab for my wedding on September 2011 taking us all from Fareham to Portsmouth and return. Great for me as provincial (my favourite operator) had many of this type. A proper bus, brilliant. Wasn’t the Arab IV well established by 1954? I don’t recall Portsmouth Corporation having any vehicles for private hire work, be they coaches or DP type. It was a rigmarole for bus enthusiasts to get one of their buses for private hire outside the Portmsouth area, little more the Portsea Island, plus Leigh Park, a Portsmouth Council housing estate, where dispensation had been given after it was built. However, some arrangement enabled the open-topped TD4’s to go to the Epsom Derby. Portsmouth Corporation did operate some dual purpose vehicles in it’s final years. 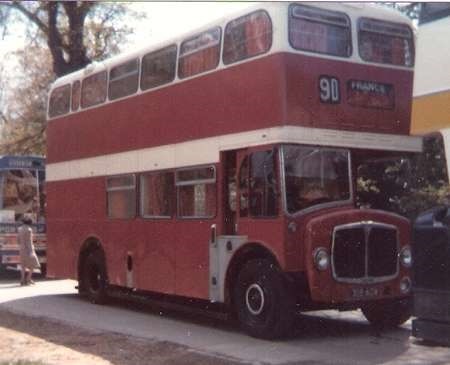 These were the three Leyland National 2s, nos 98-100 (CPO98-100W) with DP40F bodies, and a zig-zag red on white livery. These were delivered in 1980. In 1982, the Corporation added three Dennis Lancets (95-97), two were buses (B35F), and one (95, GTP95X) was DP33F. All three were bodied by Wadham Stringer. Finally, the Corporation bought a "proper" coach, secondhand from a dealer. 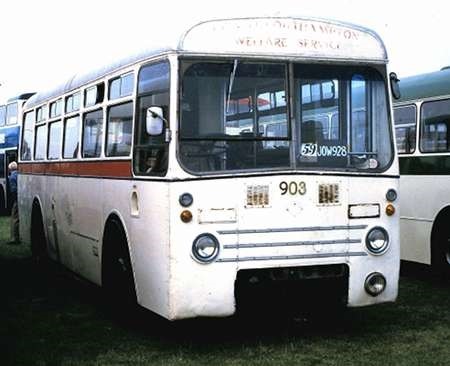 This was a Leyland Leopard / Duple C57F, numbered 101 (AUS644S). Then, in the new era of Portsmouth City Transport "arm’s length" company from October 1986, they added two more second hand coaches. These were also Leyland Leopards with Plaxton C51F bodies, and came from Bournemouth. They were nos 104-105 (FEL 104-105L). Apparently PCT Ltd also hired two Shamrock & Rambler Leopard/Plaxton coaches in the summer of 1987. Several of these came under Southampton ownership when Southampton Citybus took over Portsmouth Citybus in July 1988. However it seems to be a quite complex arrangement as to who owned or borrowed which ones in this era. Then along came Stagecoach, then Harry Blundred, then First Group . . . all change! Sorry, this is a long way from the Guy Arab III in the original image. As a teenager, I often visited Southampton when these were the main components of the fleet, so the image brings back good memories. Also, as was mentioned above, some ended up with Provincial at Gosport and Fareham, joining that company’s very similar buses. Those purchases seemed a perfect fit, as even the destination screen arrangements were virtually identical – just the alignment in the front panel being the clue if you know what to look for. I much preferred the Guy Arabs that Provincial acquired new, which had a less spartan interior finish than the Southampton vehicles, while the 5LW gave a better looking profile, but, of course, Southampton needed the 6LW for the long steep hills while Gosport and Fareham had few hills and nothing of any note. Sorry Pete, I’m afraid I don’t know the reason why the Atlantean livery was not extended to the front engined types. 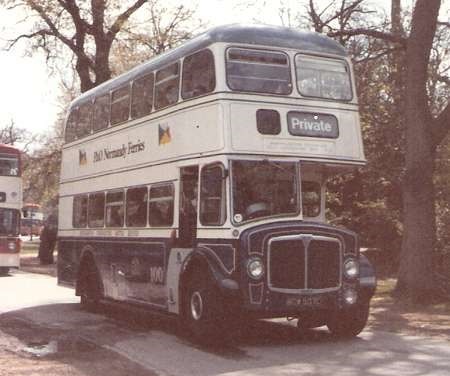 I suppose one could speculate that it was a form of "OPO" livery, in a similar manner to the Bristol Omnibus Company in the few years just prior to the introduction of NBC standard liveries in 1972 – but it would be purely speculation. I would also add that there was something of a tradition of specific classes of buses retaining different liveries in SCT. 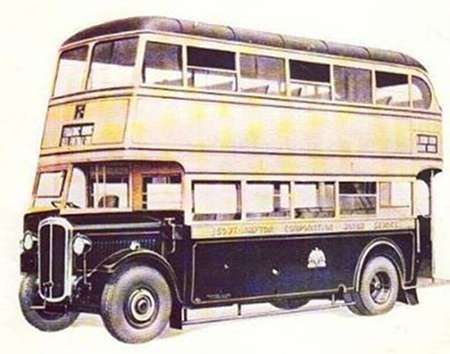 One commentator referred to the silver roofs of the Guy Arabs (double and single deck), the Park Royal bodied Leyland Titans and AEC Regent Vs, and the Nimbuses. As far as I know that feature was included at repaint. Then there were the Swifts and Seddon RUs – Swift number 1 always had a different layout of colours (and, I think, a different shade of cream). I also think that the Seddons had another, richer shade of cream. It would not, of course, comply with modern thinking on corporate images, but I don’t ever recall thinking that the services were operated by anything other than one single operator! On the other hand, one could argue that the various livery layouts had been adapted to suit the respective vehicles. Now that’s something that today’s livery designers could learn! Well, thank you so much, Michael H, for clarifying the situation on Portsmouth Corporation’s DP buses and coaches. I left Portsmouth in 1976 and was not able to watch the twists and turns of Portsmouth Corporation in its later years and its death throes. I’ve looked on the web and can find no photos of any of the vehicles you mention. You didn’t mean it this way, David W, but your comment that "Fareham had ‘nothing of any note’ reminds me of an old tourist guide I read many years ago which described Fareham as being "devoid of interest"! Between 1949 and 1952 (when aged 7 to 10 years) I lived at Alverstoke, where the standard type allocated to the Gosport – Haslar route 11 was the 5LW Guy Arab III with Guy built bodywork on Park Royal frames. In appearance, they were essentially identical to the 6LW Southampton examples, which, to the delight of a visiting small boy, seemed to be operated in huge numbers in that city. Several of these would subsequently become part of the Provincial fleet. Much later, in the late 1960s/early 1970s, I would travel to the city for Institute of Transport meetings at Southampton University, and contrived to catch a Guy for the local part of the journey whenever possible. The Arab III/Park Royal combination is my favourite bus of all time, and I believe that its standard of ride, dependability and operating economics have never been equalled. Geoffrey Hilditch stated that a Guy Arab fleet could regularly offer a 98% standard of reliability, a figure that included engineering spares and buses on overhaul. Nothing else surely could match that. The 1951 Arab IV evolved from the 1950 specification issued by Birmingham City for their new Guys, and, in addition to the repositioned front bulkhead to eliminate the radiator ‘snout’, the updated chassis included features better to meet the requirements for 8ft wide bodywork. The Arab III was offered alongside the Arab IV until late in 1953, and Southampton’s Nos.67-73 batch must have been among the very last deliveries of the type. A picture of No.71 in service may be found on the OBP Southampton gallery. In 1961 Southampton plummeted from the sublime to the ridiculous with its PD2s, the execrable appearance of which led the Corporation to abandon Park Royal after a loyalty of some 33 years. Living in Southampton in the post war Guy Arab era, I have to declare a fond predilection for these vehicles. Although the 64-73 batch were Mk III Arabs, they did have a different exhaust system layout to the earlier vehicles. This batch had a larger diameter system with the pipe located behind the offside wheels; all the other Arabs in the fleet had a smaller diameter system with the exhaust outlet in front of the offside wheels. In 1961, Mr Jenkins, the deputy GM always attributed their superior performance on the road to this difference. This batch certainly had more oomph! than their predecessors and coped effortlessly on the hillier routes 4 and 6. Of the ten I always thought No 68 (LOW 214) was the pick of a very good bunch. Slightly off subject, but I was told a story that the original So’ton livery was blue/white as per the Regent V BOW 507C in the photo (but without the P&O sponsorship!). This was changed to red/cream when So’ton gained a Labour council sometime between the wars, and there was no way they were going to have blue buses. Can anyone confirm this? Also the first batch of Regent V’s might well qualify in the Ugly Bus page see photo of 318 AOW attached. I think the Arab’s that went to Provincial were mainly from the earlier batches, which indeed had things like exposed bulbs for the interior lights, & a sliding window between the lower saloon and the cab, which allowed the conductor and driver to chat . Did you know that the good old "Jelly Mould" interior lights fitted to later models is still in production today . Sorry about the poor picture quality. The photos were taken at So’ton Centenary in 1979. David F, I can’t comment on the reason for changing from blue to red livery, but the blue is certainly the pre-war livery. The Regent painted thus for the Centenary is one of the views in our editor’s file for consideration, along with a note on the reason for the P&O adverts. Roger, you describe the Park Royal bodies on the PD2 as ‘excrable’. I’m sorry, but I didn’t think they were as pretty as that! Here’s a coloured photo of an early 1930’s Thornycorft Daring in Southampton Blue with blue roof. At some period, the blue roof was dropped. The corporation favoured this local bus builder for a period and, guess what, they had Park Royal bodies! Sorry, Chris. Didn’t mean to offend Fareham. I was really writing about the lack of steep hills. My favourite Guy Arabs were the Southdown Mk.IVs of around 1956, with Park Royal bodies. If your story is true, Davis F, it just shows how petty politicians can be. I recall that, when Big Ben was thoroughly renovated some years ago, it was found the the clock faces were originally blue and it was suggested that, in the interest of historical accuracy, the faces regain their original colour. Labour objected vehemently and it was not to be. How childish! Taking up the point made by Peter E about the livelier performance of the later Guy Arabs, Gardner introduced the ‘K’ type LW range of engines in 1950, which, for the 6LW, raised the output from 102 to 112 bhp. That should have made a difference, but I would have expected all the Arabs from No.184 onwards to have exhibited this improved performance. Perhaps that revised exhaust system did provide a magic ingredient. It’s all right, David W; I was amused, not upset! Chris Hebbron writes of difficulties in finding photos of Portsmouth Corporation’s coaches and duple purpose vehicles. Portsmouth Citybus and its Predecessors PSV Circle 1997. Fares Please Eric Watts 1987 Milestone Publications. Portsmouth Corporation Transport Bob Rowe 2012 Venture Publications. Had I lived in Southampton at the time, I should have been mortified to see the trams replaced by mere buses, but SCT couldn’t have chosen a worthier vehicle for replacement. I’ve read the postings with particular interest. I agree with both Roger Cox and David Wragg that both the Southampton Arab IIIs and the Southdown Arab IVs were very handsome vehicles. Bearing in mind the wonderful reliability of the IIIs, can anyone shed light on SCT’s odd decision to move away from Guys? The Arab IV would have been the ideal vehicle for the next order after the III finally went out of production. What a pity none of the Thornycrofts ever turned up languishing in a barn somewhere. Few enough single-deck Thornycrofts survive, let alone a decker. Thank you Andy for reference to the publications with images of the Portsmouth vehicles I mentioned. There is also a model of the Leyland National 2 in the stripey livery available, their ref 14702. An internet search for this will bring up an image of this, and it is a good representation of the actual thing. To answer Ian’s question, I seem to recall that in the 1959/60 period Guy virtually withdrew the Arab from the market as it was putting all its thrust on the Wulfrunian. I know committed Arab user Lancashire United bought Leyland PD3’s and Daimler CSG’s in this period and perhaps Southampton moved to Leyland for the same reason. The Wulfrunian as we now all know did not quite work out (I am being diplomatic – more like an unmitigated disaster) and Guy went back to offering the Arab around 1962. By that time Guy were in financial difficulties which may have deterred further sales. David Field’s comments about the interior lights on Provincial’s ex SCT Arabs is interesting. My memory of the post war Arabs in the Southampton fleet is that they had glass covers / shades on all interior cabin lights and that the only pre 1950 Arabs with a sliding window behind the driver’s were those vehicles used for driving training (Fleet nos 114, 129 and 150 ) none of which were sold to Provincial. With regard to the Darings, Nottingham purchased 4 second hand from Southampton in 1947, but according to a book I possess (including a corroborating photograph) these were Southampton 6, 60, 61 and 61 (OW9932 and AOW263-5) supposedly supplied originally in 1936 and 1937 respectively. (Unfortunately I am not at home at the moment, so I cannot say which of the 4 appears in the photo). They were bought to cover post-war shortages, but apparently found little favour, and were withdrawn within a year – largely, no doubt, because they were non-standard. Yes, you’re right, Stephen, and so is Chris H. I completely overlooked the four later deliveries. Southampton took those Darings after trying the early Guy Arab, which itself virtually disappeared from the market after 1936. Perhaps Thornycroft, having lost interest in the heavy psv market, was particularly tardy in completing the order, for those Darings – no.6 was delivered in 1936 and nos.60/1/2 a year later – were the very last of their kind. 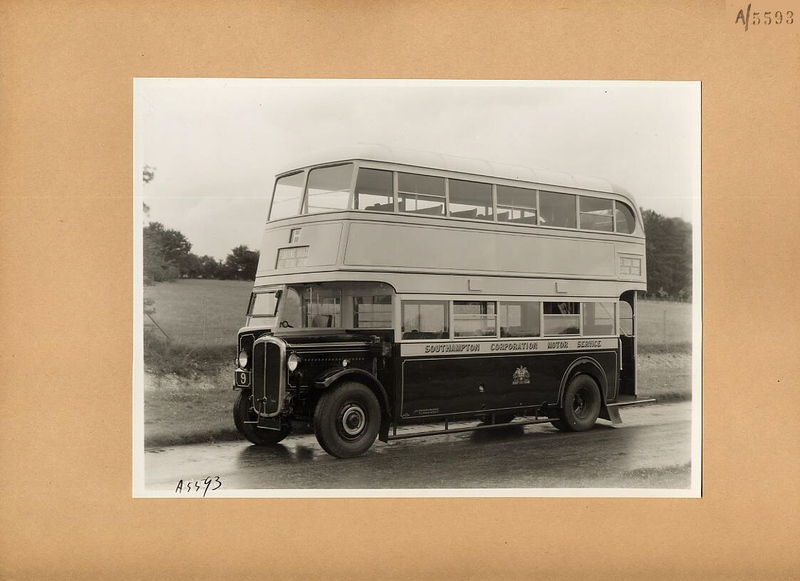 The model was officially withdrawn in 1936, though a few more single deck Cygnets were made for export. Southampton seems to have been reviewing its double deck needs at that time, as, mixed up amongst the Thornycrofts and Guys was a single Leyland TD4, surely a more advanced vehicle than the Wolverhampton and Basingstoke offerings at that time. This fact must have finally registered because the TD4 and then the TD5 became the standard Southampton double decker until the advent of the wartime Arabs. Living in Burgess Road in the 1950’s, most of the Arabs I travelled in were on the relatively easy 15 & 15A routes, so I wonder if these were actually Arab II in their last lives. This would explain things like the exposed bulb interior lights (set in a conical mount as I recall). I can also recall how dim these lights were when the buses were stopped at Swaythling, with engines either idling or possibly even stopped. When it was time to move off, the interior became a veritable blaze of light as the generator kicked in. I don’t think batteries were high on the Council’s spending priorities! There was no need to go to Southsea funfair for a roller coaster ride, all you had to do was get on an Arab LUF single decker that was running late and go down Lances Hill…far scarier than the roller coaster & cheaper too. And, as another aside, I saw a Dennis ‘dustcart’ yesterday, an Elite6 model. I’d assumed that Dennis had given up making all but Alex-Dennis buses. Seems not. David, in MacFarlane-Watt’s book, he lists the Arab II members of the fleet, in the DTR series, and says they were delivered in 1944 to 1946. Most were 5LW but DTR907 onwards were 6LW. The first of the Arab III 6LW fleet is reported as being FCR194, delivered in 1948. The last SHMD Daring survived with them until 1959! So those few buyers had their moneysworth out of them.It is a shame that none survived. Thx, Andy H, for the headsup on books with photos of coach/dual-purpose Pompey vehicles. Chris, the Dennis Eagle dustcart business in Warwick is an entirely separate manufacturing concern from ADL in Guildford. When Dennis fell into the clutches of Mayflower, that ill fated outfit rebranded the Guildford business with the juvenile name "TransBus". It sold off the Dennis Eagle municipal vehicle side in 1999, and that, together with the "Dennis" name, is now owned by the Spanish firm Ros Roca, which still has a manufacturing base in Warwick. The Guildford factory also made the well known fire appliances until 2007 when the reality of meeting spasmodic and small orders to differing specifications made production uneconomic. The Sabre and Rapier fire engines are regarded as the best machines of their type ever made, but nowadays appliances are built on much cheaper modified standard lorry chassis. Fire engine bodywork is still constructed in Guildford on all makes of chassis by John Dennis Coachbuilders, formed in 1985 by a grandson of one of the family company founders. An interesting point – in the Econic, Mercedes have copied the Dennis dustcart chassis concept whereby the engine is set back to give a low, unobstructed cab. Imitation is the sincerest form of flattery, and Dennis Eagle generally supply the dustcart body anyway. Thanks for the information Roger. I – and I’m sure many other people – had simply thought that a modern Dennis was a Dennis, whether it be a ‘dustcart’ or a bus. It just shows how the modern vehicle markets have evolved. I suppose it is not dis-similar to Volvo, where the car business was sold to Ford some years ago, yet the Volvo name continued to appear on both the cars and the commercial vehicles. (Following it’s later sale by Ford, Volvo Cars is I believe now owned by a Chinese company). Although it is somewhat sad to learn that Dennis Eagle is now under foreign ownership, at least – as is the case with DAF Trucks in Leyland – production remains in the UK, and continues to provide much-needed jobs in the engineering sector. What a complex world we live in nowadays, Roger, but your clearly explained post makes the position clear. Underneath the huge chromed DENNIS name was a circular chrome disc with a complex pattern not decipherable at a distance. At least one member of the iconic Dennis family is still in business. This story is slightly less complex than that of Dunlop, which can be read in Wikipedia, if anyone has an hour to spare!! Peter Davies’ reference to A K MacFarlane Watt’s book on Southampton City Transport (1977) both helps and hinders on two recently posted topics. First, pages 50 and 51 clearly show the interior lighting of the post war Arabs and presumably also extant on the lower decks of 164 and 167 and on both decks of 71. His fleet listing of the Mk III does contain a major inconsistency; in that the chassis numbers carried by 104,106-108, 111-112 and 114 were a continuation of the Mk II series.The PSV Circle Fleet History (1993) has got this matter ‘spot-on’. A key difference could be found in the cab layout:- the Mark II’s had the instruments display mounted in a wooden frame attached to the body below the driver’s windscreen; the Mk IIIs had the display mounted below the steering wheel contained in a black bakelite housing. The comments about dim lights rings a very familiar bell! When I worked at SCT in the mid 60’s, drivers were instructed never to leave a full ‘set on’ when the engine was off! Most of the time however the 12volt system worked pretty well and considerable attention was paid by the maintenance staff to keep vehicles’ batteries in good order. Thanks for that info, Peter. I can remember the DTR regd Arabs, I’m sure on the 15A route. So these are probably what I’m thinking about. Would I be right in thinking they had fabricated rear & possibly front domes? So would have been utility bodies? All bar one of the DTR utilities had been withdrawn by 1952 bar one which was eventually rebuilt into a tree lopper. I cannot recall therefore any detail relating to their bodywork. C Phillips (16/12/16 – 15:09) refers to a change of colour scheme around the time Southampton gained city status. 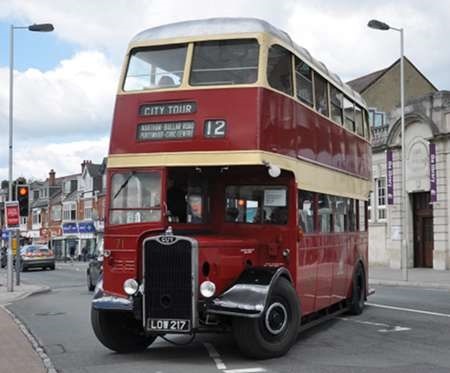 Southampton was granted city status in 1964, but the change from the blue livery to red for the buses took place in 1945. Ashley Macfarlane-Watt’s book confirms Roger’s explanation above, i.e. that the blue livery did not wear well. To be fair, it would have been thoroughly tested in the previous 6 years, but I can also recall an article in "Buses" in the 1970s referring to problems of durability with blue paint, and hence the relative rarity of blue liveries. The first 12 Leyland PD2s (301-12) were delivered in a red livery with just 2 narrow cream bands, but this did nothing to enhance the overall beauty of the PD2/Park Royal combination, so the livery was changed to include larger areas of cream fairly soon after those buses were delivered. As I understand it, from Mr Macfarlane-Watt’s book and contemporary photos, it was only those first Titans that ever carried that livery, and the subsequent Park Royal-bodied AEC Regent Vs and Leyland PD2As all carried the livery with more cream from new. The main roof panels (excepting the front and rear dome sections) were silver, but some buses ran with all cream roofs for a time. These vehicles retained their silver roofs throughout the rest of their careers with SCT. 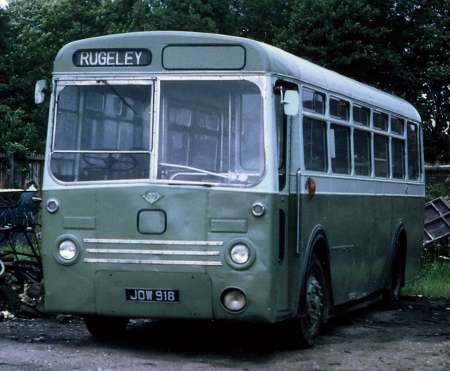 When the East Lancs-bodied Regent Vs commenced delivery a year or so later, these carried all cream roofs, and had a deeper cream band below the upper deck windows. There were, therefore, minor changes to the livery for some vehicles "around" the time that Southampton gained city status, but Mr Phillips’ recollection of a bus with a silver roof in 1964 would almost certainly be correct – at that stage, most of the fleet had them. Going further back in this thread, Chris Hebbron (22/08/16 – 09:23) says, with respect to private hires outside the Portsmouth city area: "However, some arrangement enabled the open-topped TD4’s to go to the Epsom Derby." This was probably allowed because the buses were not hired as a means of transport, but as mobile grandstands. Southampton used to hire their open top Arab for the same purpose, but they didn’t carry any passengers to or from the Derby. I believe some operators did carry passengers on open toppers going to the Derby, but I would think those were for shorter distances. The prospect of 60 or 70 miles at a maximum of 35 m.p.h. on the top deck of an open topper would probably not appeal to most visitors to the Derby! Your comment about long journeys by bus, Nigel, reminds m of the London Transport RT’s which used to come to Southsea on Summer garage outings up to the early 1970’s. They would park on Southsea Common by Clarence Pier and the families would disgorge for the day. They would invariably display the home garage on the blind display, along with PRIVATE in the main box. I always recall a green one displaying Watford Garage, which, according to a quick look at G Maps, was nigh on 90 miles away, but there were no motorways/dual carriageways then, apart from the Kingston and Milford by-passes and a short straight stretch north of Horndean. A break at Hindhead and something like 40mph max would have taken about 4 hours. I’m assuming that crates of beer, with concomitant extra stops, were not in the equation! I am interested to find out what year Southampton Corporation did away with the rear destination blinds on their rear platform buses. When I lived in Southampton back in the 60’s, all of the buses as I recall had a destination blinds at the front and at the rear along with the route number. I recall on a trip back to Southampton finding that all of the buses had had their rear indicator blind windows painted over and only the route number was being shown.